We thought it was all over on October 17th, 2013, when the country took a sigh of relief as we missed the fiscal cliff that would have put the country in default and possibly on the road to bankruptcy. But in reality on October 17th, Congress and the President did not end the government shutdown, they only delayed it. The government, which has always been adept at putting off addressing important issues, only delayed making a decision. In essence, they agreed to continue to disagree at least until January 15th, 2014. The more important deadline they agreed to delay was the deadline to renew the federal government’s ability to continue borrowing funds necessary to run the government. This was delayed until February 7th. Considering that approximately 3 weeks ago the IRS advised the public that they would delay accepting tax refunds until January 28th, the likelihood that the tax refund season will be delayed further now rests on whether the government can reach a budget agreement. If you assume the executive and legislative showdown goes to the final hour on February 7th, as it did in October 2013, and add the two additional weeks the IRS needs to prepare, the beginning of tax season would logically be around February 21st. One accountant, Robert Bourgeois, an accountant for 27 years in Nassau, New Hampshire, is quoted by The Telegraph as agreeing with that the delay could be as late as February 20th (see article). Unfortunately, the government is insensitive to the realities and meaning of tax refund season for millions of Americans. 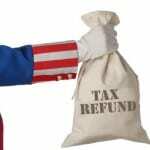 Many use their much needed tax refunds to purchase large and smaller ticket items that they generally have difficulty saving for during the year. Others use the money to catch up on bills. While others who have been too far behind on their debt for the refund to make a significant difference, use the money to get a fresh start by eliminating their debt and rebuilding their credit through filing bankruptcy. To continue monitor this implications and changes to the upcoming tax season stay tuned to the Merna Law blog. If you found this article helpful please Google+1 this page to help others find the content. If you are considering bankruptcy and need more information you can call for a free consultation at 800-662-8813 or click the button below. Click To Schedule A Free Bankruptcy Consultation Today!